Meniere's disease often breaks the general rules of ear disease. Hearing loss in Meniere's usually starts out with a low-frequency sensorineural pitches. Almost all other ear diseases begin with damage to the highest pitches first. Another difference is that there can be an excitatory phase to Meniere's followed by the inhibitory phase. This results in nystagmus going the "wrong way" -- beating towards the bad ear rather than away. 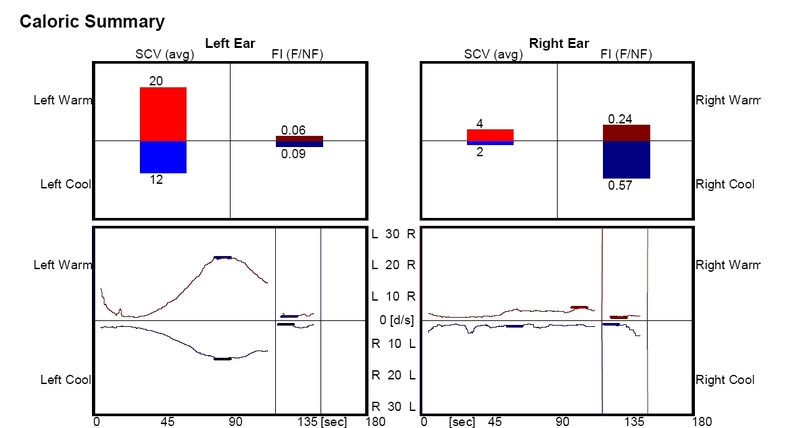 Head-shaking nystagmus can also go the "wrong way", showing that the problem appears to be an increased sensitivity of the vestibular system on that side, rather than another mechanism such as bechterews. The case and video below illustrates a patient with very well documented Meniere's, and "wrong way" spontaneous as well as head shaking nystamus. 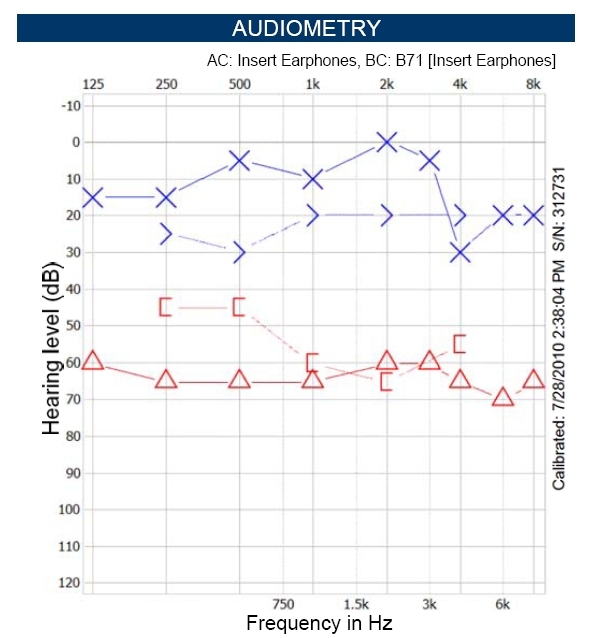 Audiogram shows flat sensorineural hearing loss at 60 db, typical of late Meniere's disease. 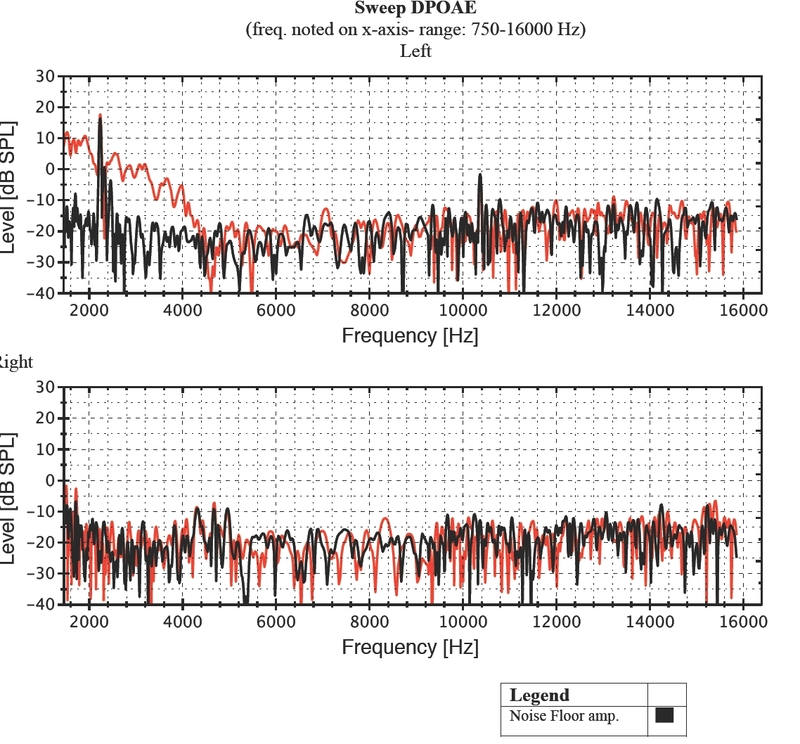 DPOAE shows no responses on right side. Responses on left side are typical for age. Caloric test shows reduced but not absent response on right side. 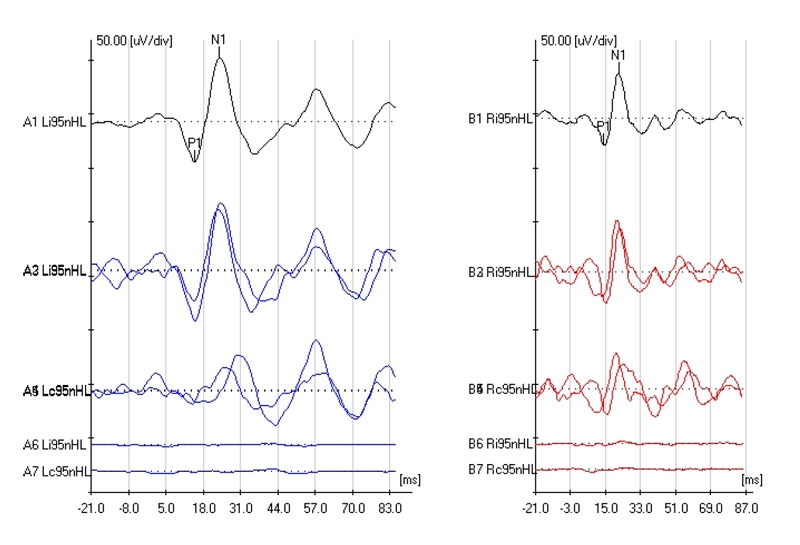 VEMP shows preserved responses on both sides, the left being moderately better than the right. Video of spontaneous and head-shaking nystagmus. This was recorded when the patient was very "active" with hearing loss, fullness, and daily dizziness. A few days after this recording, the patient had an otolithic crisis of Tumarkin attack. Wrong-way nystagmus is also called "irritative" nystagmus. However, this presupposes the cause and we think that "wrong-way" is the better term. Why is there "wrong way" nystagmus ? The conventional explanation is that at certain stages in Meniere's, the ear is excited (some call this irritated) rather than inhibited. Animal models have suggested that this explanation is wrong (Brown et al, 1988). However, animals are not people, and the models may also be wrong. We still think that irritation or excitation is a reasonable conjecture. Another possible explanation is recovery nystagmus, or "Bechterews". The idea here is that initially the vestibular system is damaged, provoking an adaptive change in the brain. Then the vestibular system recovers, and the adaptation has to be reversed. One would think that for the first explanation, head-shaking might also be reversed (as was seen here). For the second explanation, one would think that head-shaking (and vibration) would go in the opposite direction of the nystagmus. A third and very recent explanation is that the enlarged endolymphatic passages in the bad ear cause a relative increase in force exerted on the cupula, and excitation. This explanation doesn't really explain spontaneous nystagmus, but it might explain asymmetric high-velocity VOR. Brown, D. H., et al. (1988). "The membrane rupture theory of Meniere's disease--is it valid?" Laryngoscope 98(6 Pt 1): 599-601. Marques, P. S. and N. Perez-Fernandez (2012). "Bedside vestibular examination in patients with unilateral definite Meniere's disease." Acta Otolaryngol 132(5): 498-504. Parnes, L. S. and D. Riddell (1993). "Irritative spontaneous nystagmus following intratympanic gentamicin for Meniere's disease." Laryngoscope 103(7): 745-749.